When I first heard of healthy fast food restaurant LEON I got quite excited actually. Healthy fast food?! I didn’t even know anything like that existed! 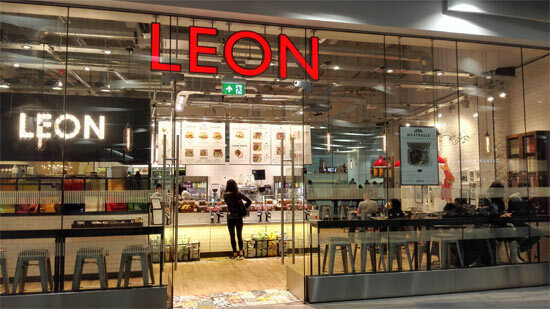 LEON is actually a healthy fast food restaurant chain and recently it has opened its first branch in Birmingham, close to the main atrium of the New Street Station / Grand Central complex. 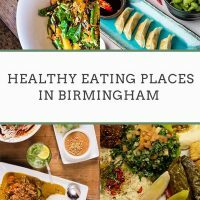 I’ve been invited to the official opening but unfortunately I couldn’t make it, however, I managed to visit the restaurant at a later date and had a meal there so I can now tell you what I really think about this new healthy eating place in Birmingham. I am not sure how I have not stumbled upon LEON restaurant before. It’s been operating for 11 years! I definitely live in the wrong town, but luckily now LEON is only a train journey away. After doing a bit of research online, it’s actually pretty clear why I haven’t been to LEON before. It’s because it’s mostly London-based but now is expanding and opening new branches in other major cities across England as well. To find your nearest LEON restaurant, just go to their website and do a search on this page. You can read more about where they source their ingredients from on their website and here you will also find about how they are planning to improve the sourcing in the future and about their sustainability efforts. I was sent two vouchers for myself and a friend to try out LEON’s healthy fast food menu. I took my boyfriend with me and with the two vouchers we had a drink, a main and a side dish each. We decided to have different dishes and drinks each so we could try each other’s choices. 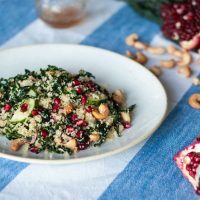 I decided to go for their Vegan SuperClean Quinoa Salad which was also gluten-free The salad contains only 328 calories which makes it a great option for those watching their weight. It comes with semi-dried tomatoes, peas, cucumber, fresh mint and parsley, and is topped with pomegranate seeds. It turned out to be tasty and moist, perfect for a healthy lunch and something that I would recommend. For a side dish, I decided to have baked fries. Yes, baked fries! When I saw this as an option on the menu I couldn’t say no. I rarely have fries for the obvious reasons but I do love them, who doesn’t?? Baked fries tasted really good and if I ever have cravings for fries, LEON restaurant will be my go-to place from now on. Yes, I would go there just for baked fries. Fewer calories than normal fries but just as satisfying. When it comes to drinks I was really happy to see the coconut water on the menu but unfortunately, they ran out and I had to pick an alternative. I decided to go for their Beetroot Bramble juice which was ok but not as healthy as coconut water. Of course, they also have bottled water if you fancy something plain. 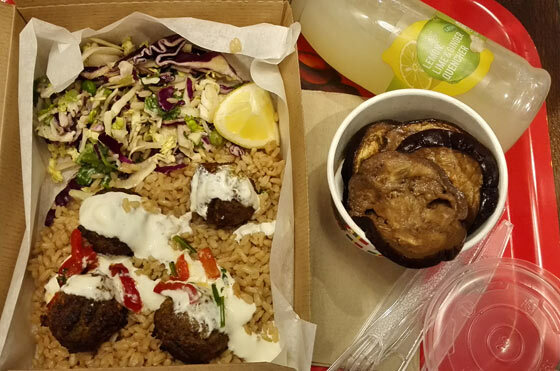 My boyfriend went for Sweet potato falafel hot box, roasted aubergine side dish and a bottle of Lemon ginger drink. Overall the meal was great and quite filling. I had a taste of falafel which was flavoursome and not dry, however, the brown rice was slightly on a dry side and needed some kind of sauce on top or maybe just a drizzle of olive oil. I loved roasted aubergine. 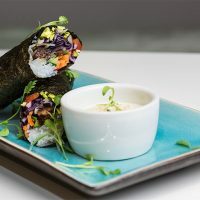 If you wonder what other vegetarian options they have on their menu, you will also find Grilled Halloumi wrap, Original Superfood salad and Roasted Cauliflower Salad with Chimichurri. For breakfast, you will find some other vegetarian options as well. Overall, the food we had was pretty good but I have to mention that they use sunflower oil in their superfood salads which is slightly disappointing considering that their menu is based around the Mediterranean diet. I’ve asked their PR representative about this but I haven’t heard back. Also to mention, not all the food on their menu is healthy, for example, Chorizo, but at least you have a choice and if you really want to eat healthily you won’t pick this option anyway. Will I be returning to LEON healthy fast food restaurant? Yes, definitely yes, I would love to try the other superfood salad they have on their menu and I definitely want to come back for more of those baked fries! Their dishes are overall pretty healthy and much healthier than other options on the high street so I would definitely recommend you come here instead of going to McDonald’s or Five Guys. The great thing about LEON restaurant is the speed of the service, but the most important thing out of all is the nutrition you get with the food – vegetarian options are really nutritious (meaty ones are a little bit less), making it a great place to go to for all those people who like to eat healthily also when out and about. The menu is not perfect of course and some improvements could be done to the ingredients they use, but it’s good enough for me to return. Have you been to LEON healthy fast food restaurant before and what did you think? DISCLAIMER: I have been sent free vouchers in return for my honest review. I have not received any other compensation for this post. Good to hear you like their menu! I will be definitely back for more!